On the North Pole Departure of June 23, 2019, our photography experts will be available to help you with your camera, as well as your photography, both on and off the ship. In addition to hands on help, guests can expect photography workshops. Sue Flood is a professional wildlife and travel photographer. Sue has been working in the Polar Regions since 1998, although her work increasingly takes her to warmer climates to thaw out. Cindy Miller Hopkins is a full-time travel and wildlife photographer with thousands of publications to her credit. Her images can be seen on the pages of text books, travel brochures, calendars, and other consumer products, as well as U.S. and international magazines and newspapers. From Helsinki, your charter flight will take you to Murmansk, Russia, where you’ll embark on your voyage to the North Pole and get acquainted with 50 Years of Victory, the world’s largest and most powerful icebreaker. Being on board Victory and feeling the icebreaker as it crushes through the arctic pack ice is an experience you’ll never forget. Just as memorable is boarding the ship’s helicopter for a thrilling aerial view over the ship and the expansive Arctic Ocean. You can expect variable sailing conditions this far north. The crossing from Murmansk to the North Pole can take us anywhere from four to six days depending on the ice conditions. This means you’ll have plenty of time to get to know your shipmates and be treated to lectures and discussions by our Expedition Team while looking out for birdlife. 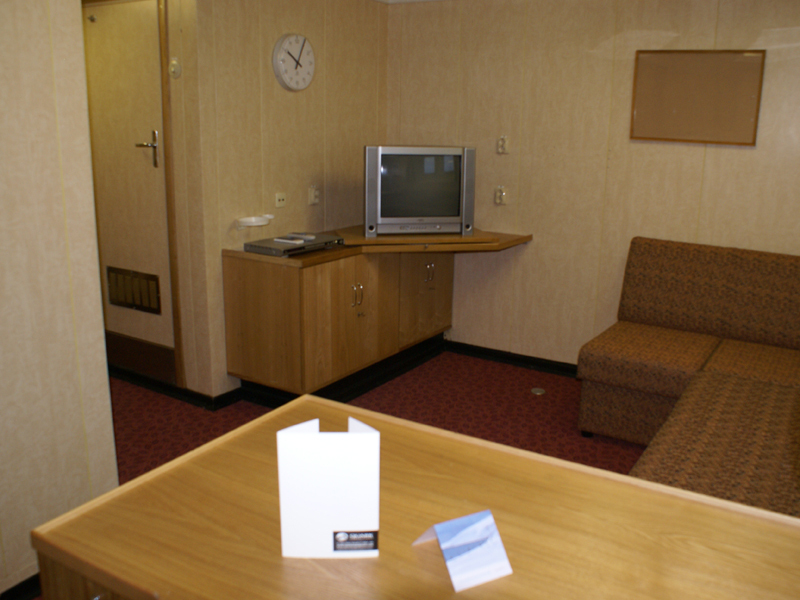 There are also many wonderful amenities on board, such as the ship’s lap pool or basketball court. The anticipation reaches a climax as you arrive at the North Pole! Many travelers find themselves overcome with emotion, while others are in a festive and celebratory mood. Take photos, call your family, wave a flag— just be sure you enjoy your moment at the top! Later, everyone will celebrate with a champagne toast and a barbecue on the ice. If the opportunity allows, you have the option of taking a polar plunge into the icy waters around the North Pole. We’ll also attempt to launch passengers high above the Pole in our hot air balloon to commemorate this great moment (this is highly weather dependent). On our return voyage you can sit back and relax. As you head farther south you may get lucky and spot polar bears hunting for seals. This group of 191 islands forms the most northerly archipelago in Eurasia, and lies entirely within the Arctic Circle. Here you’ll explore Cape Flora, and discover historic remains from three ill-fated Arctic expeditions. When conditions permit, Zodiac trips beneath towering cliffs will explore remote seabird rookeries. Onboard helicopters again provide aerial sightseeing and our Zodiacs transfer you to seldom visited landing sites. Returning to Russia’s most northerly city, it will be time to bid farewell to your ship, 50 Years of Victory. You’ll be transferred to the airport for your charter flight to Helsinki, Finland to enjoy one final night with your newfound friends. After breakfast, your official Quark Expeditions journey comes to an end. We do encourage you to spend some extra time exploring Helsinki, Tallinn (the capital of Estonia) and St. Petersburg. Sitting area with sofa bed, sleeping bed separated from the sitting area, private facilities with a shower, TV set and DVD player, opening windows. Bedroom and sitting area, sofa bed in sitting room, private facilities with a bathtub or shower, refrigerator, TV set and DVD player, coffee maker, opening windows. Large bedroom and sitting room, sofa bed in sitting room, private facilities with a bathtub, refrigerator, TV set and DVD player, coffee maker, opening windows. Very spacious bedroom and sitting room, sofa bed in sitting room, private facilities with a bathtub, refrigerator, TV set and DVD player, coffee maker. Standard twin cabins have one lower berth with a curtain and a sofa that is converted to a bed each night. The private facilities are en suite, with a shower. The exterior window opens. The TV is connected to CCTV system. The DVD player is attached to the TV. There is only one Victory Suite. It has a separate bedroom and sitting area, with a sofa bed in sitting room. The private facilities include a shower. The amenities include a refrigerator, coffee maker and safe. The window opens. The TV is connected to a CCTV system. 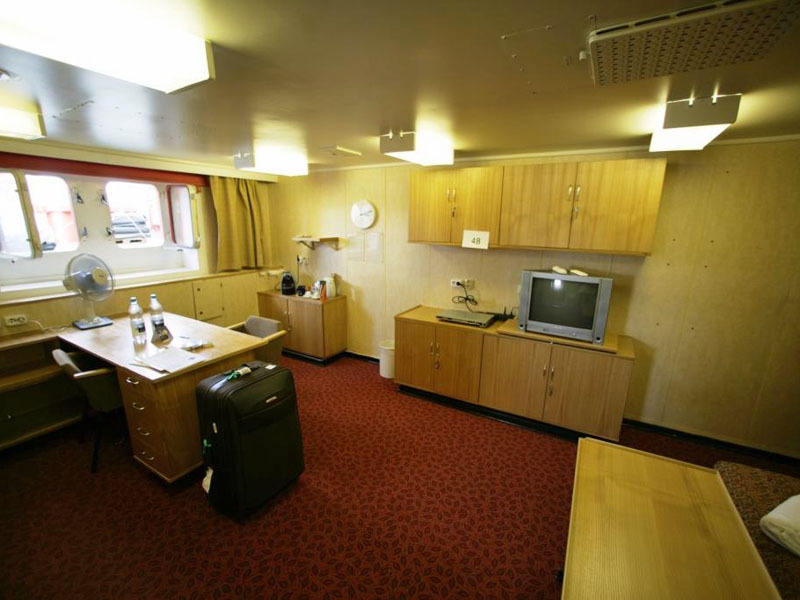 This has a very spacious bedroom with a single bed and a sitting room with a sofa bed. The private facilities have a bathtub. The exterior windows open. (Views are obstructed in cabins 46 and 48.) Amenities include a TV/DVD combination, coffee maker, safe, and fresh fruit, drinks, and snacks. We don’t have the heart to use she when we talk about i/b 50 Years of Victory – it’s not ladylike at all. Elegance doesn’t matter when it comes to the right vessel to take you to the top of the world. The most powerful icebreaker ever built generates 75,000 horsepower and crushes multi-year ice layers three meters thick. After a few days aboard, you’ll feel her (or him?) sharing power as you together battle your way through the Arctic icecap to 90º north. I/b 50 Years of Victory is not a tourist ship. Rather, the icebreaker was purpose-built to pilot scientific and cargo ships to hard-to-reach areas of the Arctic and along the Northeast Passage. It is just during the short summer months when adventurers get a once-in-a-lifetime chance to travel aboard this real working icebreaker to the geographic North Pole. Experience the North Pole in a way few will ever experience – soaring above the Arctic in a hot air balloon! When weather permits, we'll take you up for a breathtaking bird's eye view of 90° North. Don't forget your camera! When you book by June 15, 2019, you receive a free transfer package valued at $1,995, plus, receive an extra 10% off when paying in full! Prices online do not show the discounted rates. Terms and Conditions apply, special offer is subject to availability, please contact us for more details.